Business Talent Group recently released its inaugural Skills Index on the consulting skills that are the most in demand by Fortune 1000 companies, and project management, market analysis and growth strategy top the list. With skills scarcities affecting many big global companies, it’s a good time for consultants to market specialties such as these through the high-end gig economy, according to the study. The Skills Index further detailed the top three most in-demand consultant skills by industry. Market analysis, project management and strategic planning are the most sought-after in the financial services industry, while supply chain is the No. 1 in-demand skill for the consumer goods industry. Market analysis and project management come in second and third. These two particular skills appear to be in high demand across industries. Project management ranks among the top three skills for the healthcare, life science, retail and technology industries. Market analysis appears on the list for industrial goods and services, life science and retail. 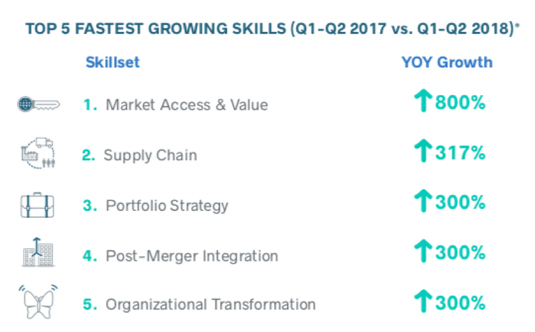 As the graphic above indicates, supply chain ranks second among skills that are quickly growing in demand, rising 317% over the course of a year. The full list of the 20 in-demand consultant skills can be found here.